How Do You Find The Perfect Door? At Window World of Columbus, we realize that a door is more than just functional. Use a custom replacement door option to enhance your South Central Indiana home’s curb appeal and bring style to your exterior. We offer many personalization options so that you can make your door stand apart from the rest of the neighborhood. Our doors are quality constructed to last you and your family for years to come. Heavy metal mainframes and strong locking systems make it easy for you to be protected from harsh elements like severe weather. Take a moment to browse through our replacement door selection. Don’t know where to start? Schedule a complimentary in-home estimate and we’ll help you find the perfect selection to fit your residence. Impress your guests as they approach your home with a stylish entry door. Choose from numerous color and frame options to make your entryway a statement of your personality. Make the transition from indoors to out as effortlessly as possible. Stylish glass paneling maximizes your view of your backyard. Easily the most elegant addition you can make, French doors open your room to let in fresh, Columbus air. A premium vinyl mainframe and sash extrusions will never chip, crack, peel or warp, so you can enjoy this option for years to come. Who says your garage door has to be boring? 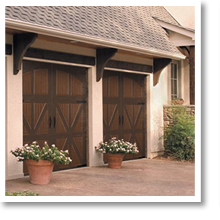 At Window World, we believe that your garage door should be as stylish as the rest of your exterior. Contact Window World of Columbus, IN Today! Our replacement door styles offer both style and protection to your Columbus, IN residence. Window World is passionate about delivering only the best customer service, and we look forward to assisting you with your next replacement project!